If you’ve been following my recent football posts, you’ll know that I’ve been playing with small multiples visualisations of shot location and chance creation. I want to visualise possession in a similar way, but try to really highlight the differences between teams. 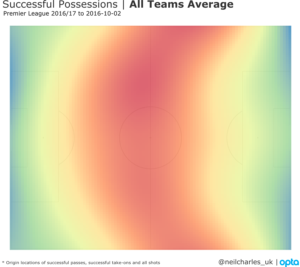 We all know that a game of football is mostly played in midfield, but rather than simply demonstrating this, I’d like a heat map that shows where teams are different from average. 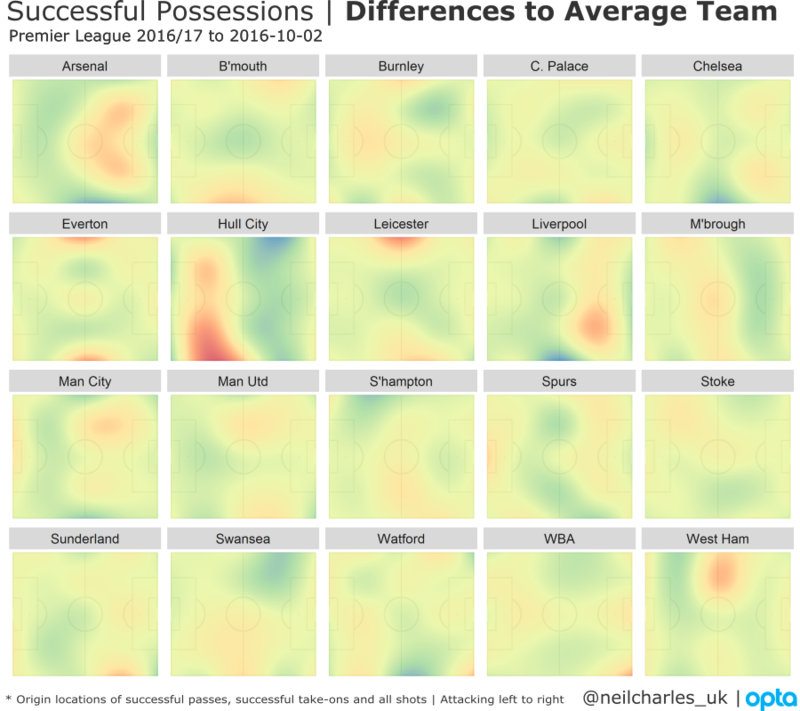 Here’s a picture of possession areas (defined as successful passes, successful take-ons and all shots), averaged across all teams in the Premier League so far this season. I’ve smoothed the data quite heavily and it looks as you’d probably expect; focussed on midfield, with possession extending up the wings more than in the centre. 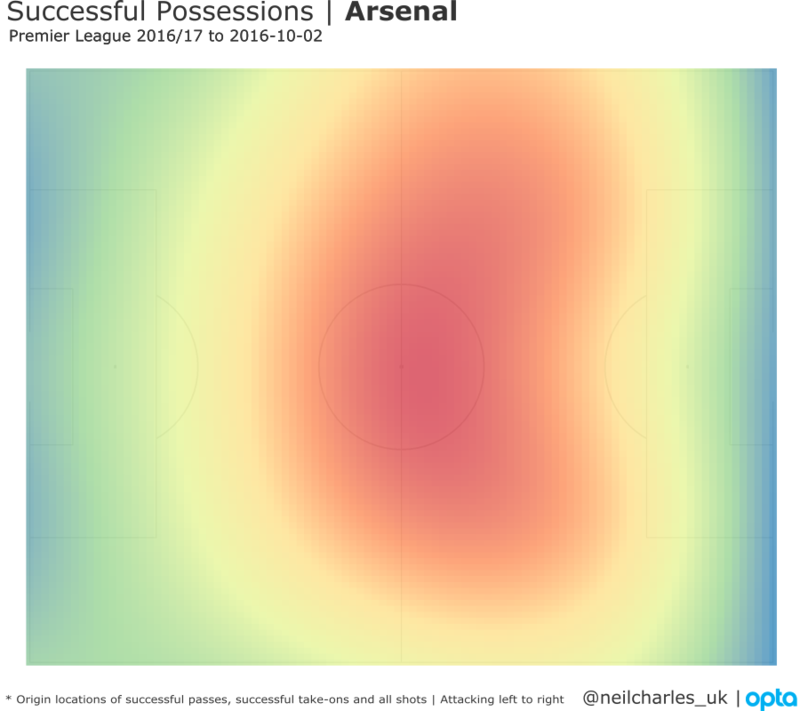 Picking one team as an example, here’s what we see in a heat map of Arsenal’s possessions. 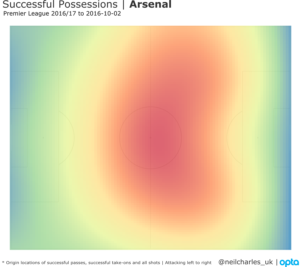 It’s obviously centred further up the pitch than for the average team, but it doesn’t shout, “this is what’s unique about Arsenal”. Now we can draw a heat map for each team and subtract the overall average map. We’re looking at where each team chooses (or is forced) to play, that is different from other teams. Here’s the vis (click for bigger).